CONSORTIUM FINANCE NETWORK: Will Yahoo Ever Rebound? 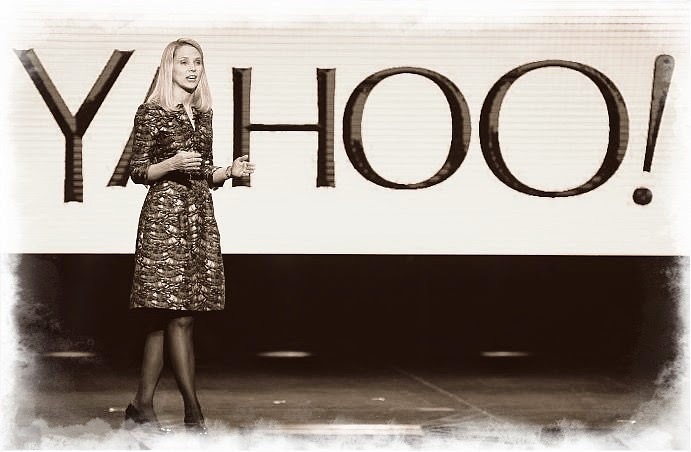 Yahoo and its CEO Mayer must make pivotal decisions about the future, or else? Marissa Mayer, Yahoo's CEO, gets much attention in the financial press, even if Yahoo's sluggish performance in recent years might not warrant it and if it appears that Yahoo is, well, such a 1990's phenomenon, as it lags in a race with behemoth Internet companies (Facebook, Google, e.g.). In this race, revenue scorecards are measured by and result from display advertising and searches. Mayer's Google pedigree explains some of the limelight. She grew up there and rose to the top rungs. Instead of waiting another decade for the possibility of becoming a Google CEO, she grabbed the Yahoo opportunity. Yahoo, the company and website, is still widely known, widely watched, and often criticized, while it has stumbled. With Mayer at the helm, it is more widely observed, as stock markets and equity analysts try to figure out whether she has the magic to turn the company around or at least craft a strategy to boost disappointing revenues. Revenues, $5 billion in 2011, have slipped to $4.6 billion in 2014--an 8% decline from three years ago, while stalwart competitors in the industry continue to grow at astounding rates. Operating profits, above $600 million in 2011, have fallen to less than $250 million, and imply paltry returns on equity (ROE, less than 5%). Operating profits in the quarter just ended, 2015, led to yet another frowning moment (an $87 million loss). Yahoo is now 21 years old and chases after some of the same advertising streams as do Facebook, Google and Twitter. Facebook revenues have now topped $12 billion/year. Mark Zuckerberg's social-media empire is already three times as large as Yahoo, although half its age. Twitter continues to gain ground, still hustling to convert tweets into advertising revenue growth that will erase a history of losses. Twitter is about a third the size of Yahoo (and it, too, reports a disappointing first quarter, 2015). Many analyze what happened at Yahoo, why the company lost momentum, why it doesn't attract eyeballs in growing numbers. Yahoo has content to lure viewers, and it has an old search engine. And it has a loyal core of users who prefer Yahoo as a gateway portal when they turn a desktop or laptop on. Others have examined how the company has tripped up from management issues, boardroom haggling and other disappointments. More important nowadays, equity investors and business watchers want to know where does Yahoo go from here. Can it ever catapult itself to the frontlines of top global Internet companies? In any analysis of this company, there is a wrinkle, an odd twist, but a fortunate one. While unlucky in many strategic steps the past decade, one strategy has worked miracles: Yahoo's decision to invest in Alibaba, the mammoth Chinese Internet shopping network that recently went public in the U.S. and competes in the same arenas of Amazon and eBay. That stake has proven to be a lottery win and, in some ways, has rescued Yahoo's bottom line and allowed it to squeeze out respectable earnings (in the form of unusual income) and present a fair balance sheet with an improved capital base. To be specific, in a year (2014) when revenues were flat and operating earnings fell, Yahoo reported net profits of $6 billion, because Alibaba's vaunted IPO let Yahoo report special gains last year above $10 billion, much of that attributed to its Alibaba stake and to Yahoo realizing some actual gain on its holdings. When the company should be preparing to compete with the masters in the industry (and thwarting other threats in the industry), its financial results are dominated by Alibaba gains on the income statement and an enormous Alibaba stake on the balance sheet. Yahoo has balance-sheet equity exceeding $35 billion, but most of that supports (or is rationalized by) its Alibaba asset. What about that Alibaba investment? Until it disposes all of that stake, Yahoo might well be a publicly traded investment fund, the fortunes of which are tied too closely to the stock price of Alibaba. Yahoo's market value, $42 billion, barely exceeds the value of its Alibaba holdings. Has the market discounted all other core activities in the company and is valuing mostly Alibaba on the balance sheet? Yahoo market values followed a pattern last year. Its stock price anticipated the build-up to the Alibaba IPO, soaring from the mid-$30's to above $50/share at the IPO, but has since dropped to the mid-$40's, while the same market waits for management to come up with a credible plan for growth. While Yahoo rediscovers or reinvents itself, the Alibaba gains and stake, in one way, offset risks of uncertainty and financial peril. While operating profits have sagged, the Alibaba fortune allows it to boost its cash reserves (if it needs to) and gives its equity base a cushion against the modest amount of debt on its balance sheet (less than $1.5 billion). Operating cash flow can't pay off that debt, but selling Alibaba shares for cash proceeds can resolve that problem, if necessary. Mayer, however, must manage that Alibaba holding prudently, but also prove to shareholders that Yahoo in the long term is Yahoo (anchored by new strategies, new products, new services and desperate tactics to expand numbers of views and clicks) minus Alibaba. Over the past year, Yahoo has become Yahoo plus Tumblr. A strategic move to purchase the blogger site is a modest move that will achieve modest results and have even more modest impact on helping to thrust the company back into the big leagues. So what can Mayer and team do? 1) More acquisitions? It appears the company still wants to do tack-on acquisitions (like Tumblr). Yahoo, for now, can't rely on cash reserves (from profits) to help finance blockbuster acquisitions. With sour earnings and no clear-cut direction, it wouldn't be easy to fund a new operation with new equity, especially if the target won't contribute to earnings right away. The Alibaba gains (and new cash) from last year permit a little more debt capacity, but lenders or debt investors can't yet rationalize new loan exposure from operating cash flow. At least not right now. They would need to be asssured they'll have access to cash on the balance sheet, resulting from future Alibaba proceeds. All that is to say that it might not be able to finance a blockbuster acquisition, if we assume that a target agrees to be acquired and the target will contribute to operating profits on Day 1. 2) A new product or service to shake up the industry? Not likely, at least not soon, because that implies Yahoo has exceptional financial strength, ample funding resources and the ability to attract the industry's best technical talent. Yahoo continues to play catch-up on all three fronts. It has, however, been able to hire content talent (in Yahoo news, finance, sports, etc.) on the premise that talent with experience from, say, the broadcasting networks and the New York Times will bring with them their viewers and readers. 2) Merge with another Internet company? Random rumors have run about regarding a link-up with AOL. How do you rationalize two strategically wandering companies with financial ailments of all kinds combining to form a stronger company? One plus one, in this case, might equal a half. 3) Sell out to Google? Google, its giant neighbor in the Bay Area, could take over Yahoo with an eye-blink--if it chose to. But its corporate strategies aim far and wide. Google has other more ambitious dreams and plaguing issues (driver-less cars, European lawsuits, etc.). 4) Merge with a natural partner, Alibaba? If this were a strategic possibility, it would have happened already. With different leaders and markets (and financial challenges), the two companies are headed in different directions. Yahoo is grateful for its great gains and must forge its own path. The company is not headed into a bankrupt courthouse. There is value in assorted ways. There is a balance sheet not too burdened with debt and with comfortable cash reserves. It needs the right strategy (and product and service) to give the revenue line a swift kick upward.